Airtel joined in releasing a Night data plan for their subscribers. All the networks in Nigeria wants to satisfy and and get more subscribers to themselves. Just last week MTN introduced their own Night data plan and now Airtel is on that same trend. Making life easier for subscribers is now the main priority of all network providers, just through their better added services. Things are going well now, gone are the days when you will be looking for cheap subscription to use on your different devices. Now one can easily cool his mind down and select any data that suits him/her self with any network provider. HOW CAN I SUBSCRIBE TO THE NEWLY LAUNCHED AIRTEL NIGHT PLAN? The night plan starts from 11pm and exhaust or expire by 6am. During the time of use, you can make free calls with it as well. So make good use out of it. Now, to subscribe for the cheap night data plan which airtel launched newly, see how it works. First, you will need to migrate to Airtel SmartTrybe just by dialing this ussd code *312*1# and after that go for any of the below subscription. The airtel night plan works with time alone and its unlimited when subscribed for. 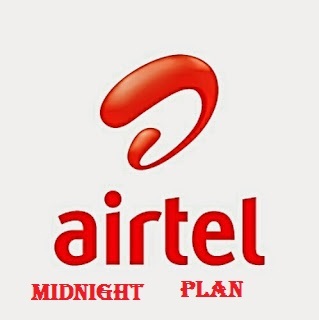 √ The second Airtel night plan is charged at N200 and the time duration is 2hours. To subscribe dial *312*4# and that's all. The Airtel night plan works on all devices be it Blackberry, Android, iOS, also windows phones and as well PC. So go and flex you data. Glo and Etisalat Network providers, very soon they will come up with their own new night data plans, I hope so since MTN and Airtel night plans are already out. But before they will come up with there own let's enjoy the ones already out. Share with friends with below buttons, if you found the post interesting.